The Mead Park Lodge (or ‘Apple Cart Food Co.’) the popular breakfast and lunch destination owned and operated by New Canaan’s Emad Aziz, has earned perfect or near-perfect marks from health inspectors for several years, records show. Out of a possible 100 points, the seasonal food counter for nearly one decade has earned an average of 97 during unannounced biennial inspections by sanitarians with the New Canaan Health Department, according to a review of the establishment’s files. Officials in the health department declined to provide a general characterization for such a score, not specific to Mead Park Lodge, or to offer a general comment about how all New Canaan food establishments, taken together, fare on inspections. 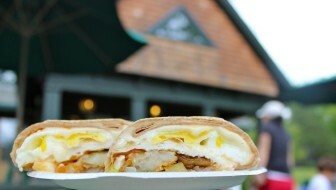 The “Mead Park Breakfast Wrap” is an anchor on the lodge’s menu, and earned a “Best Breakfast Sandwiches” nod from Terry Dinan, an expert in such matters. Sanitarians use a state Department of Public Health standard, citing eateries for violations that range in seriousness and corresponding weight from 1 to 4 points. A “failed” inspection is triggered either by one or more 4-point violations or a total score of less than 80 points. 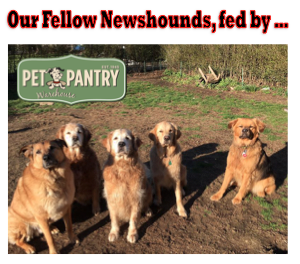 The Mead Park Lodge since March 2008—when it earned a score of 100—has dipped below 95 points just once, scoring a 94 on March 25, 2011, records show. The minor violations for which the lodge has been cited involve labeling dressings or ensuring that coffee stirrers are individually wrapped. 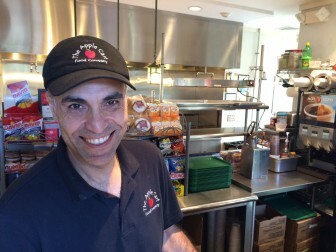 Aziz’s menu features a wide variety of fresh salads, sandwiches and wraps, and he earned a nod for his signature and hugely popular Mead Park Breakfast Wrap in Terry’s list of “Best Breakfast Sandwiches” in New Canaan.